Blinds.com, owned by Home Depot, is the world’s largest online window covering store, covering more than a million windows a year since 1996. Blinds.com makes ordering custom blinds, shades, shutters, and draperies easy and stress-free through its online and mobile experiences, helpful installation videos, award winning customer service, and its custom SureFit Guarantee. Founded in 1996 by Jay Steinfeld and his late wife Naomi, Blinds.com started off as a custom blinds and drapery store in Houston, TX. In 2001, the couple sold their store and went exclusively online, hoping to offer a seamless window covering purchase experience for a category that is often viewed as pricey, intimidating, and confusing. Now the largest ecommerce window covering store in the world, Blinds.com credits word-of-mouth and referral marketing to both the initial and ongoing success of its business. Though Blinds.com’s official referral program only dates back two years, the company’s success is deeply rooted in the practice of everyday advocacy. With an average of seven years between purchases for every customer, the primary focus of the company is to establish meaningful relationships with customers to create and maintain a full business pipeline at all times. Since the company’s inception, Steinfeld, who serves as CEO to this day, personally established relationships with the brand’s first customers to ensure they would recommend the company to friends and family once their transaction was complete. 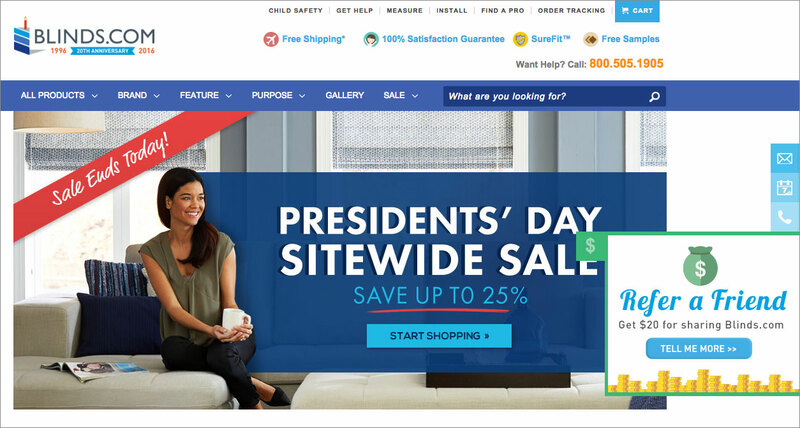 Because of this effort, Blinds.com today has a 60 percent repeat and referral customer rate, meaning that 60 percent of its business comes from customers who have previously purchased from Blinds.com or that have been referred by friends or family. 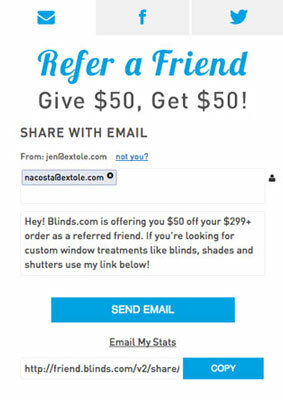 True believers that ease of use changes customer behavior, Blinds.com chose a referral program powered by Extole that is both easily accessible and simple to use, encouraging customers to continuously refer. Extole’s ability to continuously optimize the program, along with its leadership, expertise, and referral benchmarks made it the referral partner of choice. Through testing and optimization, Blinds.com has made significant improvements to its program with the help of Extole’s easy to use, always-on platform. 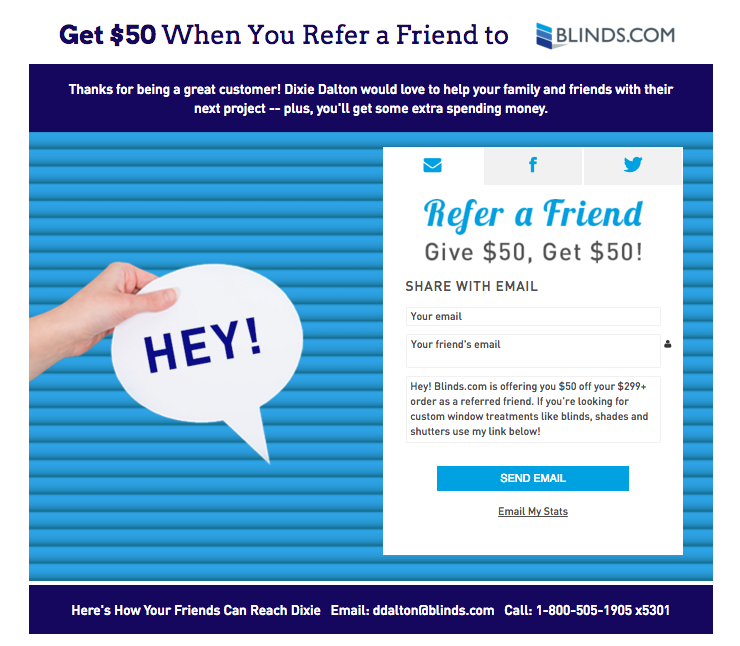 Blinds.com designed its referral program to give customers the opportunity to refer specific consultants to their friends and family during the referral process. Adding this level of personalization to the program resulted in buy-in from employees (who are promoted based on hitting sales targets) and higher conversion rates and average order values. Additionally, Blinds.com began a “Referral Stars” feature, a recognition program shown company-wide that features the top performing sales associates, along with detailed information about their recent customer wins. The increased use of personalization, rewards, and recognition improved the referral program tenfold. Initial implementation of the referral program included a traditional, templated call to action (CTA), which many felt did not match the energy or tone of the brand. When Blinds.com changed the CTA to be more aligned with its brand messaging (more creative, brighter, easier to find), there was a clear improvement in conversion. Additionally, Blinds.com is currently A/B testing other CTAs with Extole’s platform to understand what exactly gets customers excited and eager to make a referral. 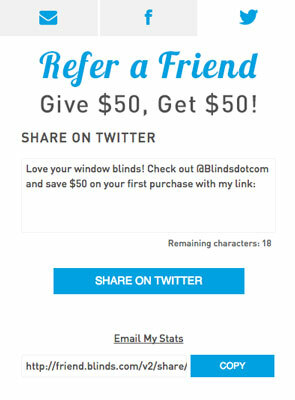 Blinds.com experimented with how it incentivizes its customers to share the program with their friends and family. Initially, the company offered a generic gift card to advocates and friends that could be used at multiple restaurants and shops but quickly found that it took too long to explain to customers the value of the incentive. So, Blinds.com switched to a Visa gift card that advocates could use anywhere and saw immediate improvement. 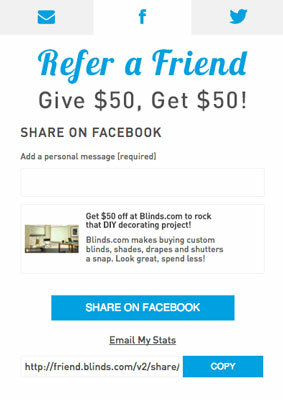 Blinds.com believes that a referral program should represent your brand, company history, and the desires of your company and customers. Most important, however, is to always optimize your refer-a-friend program – even the smallest of tweaks can make a huge difference to your bottom line. The referral marketing program at Blinds.com, powered by Extole, ensures that Blinds.com will keep a robust pipeline full of customers who are eager and willing to refer the brand after a flawless purchase experience.